Kansas City, Mo. 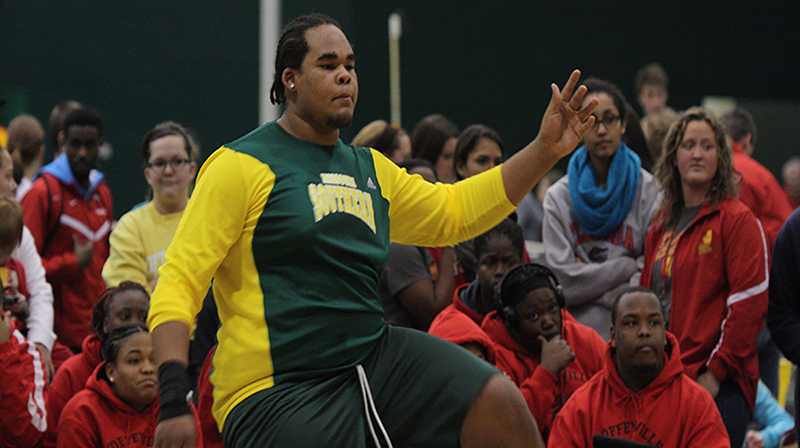 — Missouri Southern junior thrower Bryan Burns has been named the MIAA Men’s Field Athlete of the Week, the league announced today. Burns, a Carthage native, hit a provisional distance of 58-07.50 to win the shot put and break the previous MSSU school record by nearly six inches. The mark, as it stands, is the fourth-best distance in Division II this year and tops in the MIAA. Burns wasn’t done, however as he picked up another provisional, this time with a fourth-place finish in the weight throw, hitting a distance of 60-00.25. Burns and the Lions will be back in action this weekend as Southern hosts the Lion Open on Friday and Saturday in the Leggett & Platt Athletic Center.